The word "Calamagrostis" is derived from the Greek word kalamos (reed) and agrostis (a kind of grass). They are referred to generally as Reed Grasses. Calamagrostis are robust rhizomatous perennial grasses, forming tufts of linear leaves, with erect stems bearing dense branching flowering panicles in summer. There are about 270 species of these handsome, reed-like grasses from northern and temperate regions. They are slow-growing, clump-forming grasses with feathery flower-heads that generally stand well over winter, making them sought-after garden plants. 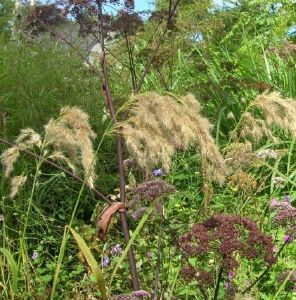 Calamagrostis emodensis is an upright clump forming ornamental grass which is fairly new to cultivation in the UK. It has striking flower spikes in late summer. In contrast to other Calamagrostis, the flowers of this variety tend to be weeping in habit and from a distance appear to be almost white. Grows to 90cm, in sun or part shade. This species is native to Pakistan. Supplied in a 9cm pot. Easily grown in average, medium to wet soils, in full sun. Does well in heavy clay soils, unlike many other ornamental grasses. Soils should be kept moist and not allowed to dry out. Blooms in light shade, and appreciates some afternoon shade in hot summer climates. Cut clumps to the ground in late winter, just before the new shoots appear.